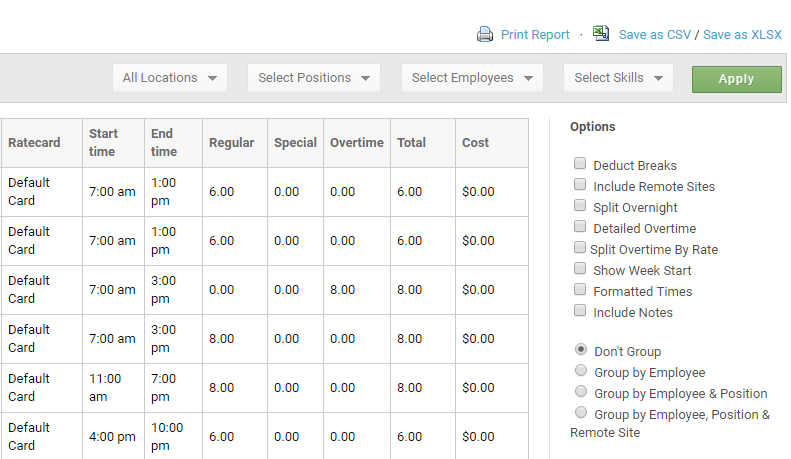 The 'Reports' tab is the operations center for critical detailed reports: there are numerous dynamic reports that you can run to keep track of staff, scheduling, Time Clock and other information critical to your workforce management requirements. The most common reports are listed on the main screen, along with explanations for each. You can also select a report from the 'Reports' list on the left-hand side of your screen. When you open a report, you will see the options to filter by the time, by the date, by the 'Location', by the 'Position', by the 'Employee' or by 'Skills'. At the top right you have the option to 'Print Report' and the 'Save as CSV' option which will save the report in a CSV file to your computer. All timeline options are held when switching between different reports. This makes reporting significantly faster when switching between report types with different options and staff selected. You can export or print any report that you create through ShiftPlanning. To print a report, first select the report and any options to customize it. Then, click the 'Print Report' link at the upper right-hand side of the screen. To export a report in .csv format, follow the same steps to set up your report, and then click the 'Save as CSV' link. In our ‘Custom Reports’ section, the app delivers the data you need, in the format you prefer, so you can make everyday decisions for your business. Our custom reports further your ability to do just that.